Dr. Sante 0% is a new series of natural cosmetics produced by the Ukrainian group of companies Elfa (Elfa Pharm). In this series, balanced modern formulae and high-quality plant raw materials give birth to an amazing tandem of effectiveness and safety which helps to restore and preserve the health and beauty of your skin and hair. The manufacturer claims that the main principle behind the new series lies in the absence of potentially harmful ingredients in any of the products. 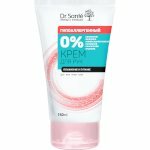 Thus all the products in the 0% series by Dr. Sante are free of SLS (sodium lauryl sulfate), SLES (sodium laureth sulfate), propylene glycol, mineral oils, petroleum jelly, silicones, parabens. Some of the products also do not contain any colourants and fragrances (neither synthetic nor natural ones), they are specifically designed for highly sensitive skin. 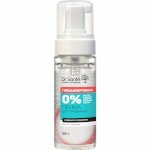 All products by Dr. Sante 0% have been dermatologically tested. Their hypoallergenic qualities are confirmed by reputable Ukrainian and Polish dermatologists and cosmetologists. As a result, Dr. Sante 0% cosmetics are perfectly suitable even for extremely sensitive or allergy-prone skin. The series includes face, body, hand and hair care products. Dr. Sante 0% skin care products include foam cleanser, facial cream and eye cream. Body care products include shower gel and intimate hygiene gel. Hair care products include shampoo, express hair mask and hair spray. 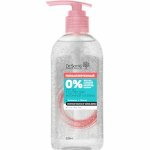 Finally, hand care products include moisturising cream, nourishing cream and hand soap. Every product in the series is characterised by a whole set of useful properties provided by an elaborate combination of natural ingredients such as natural plant extracts and oils. Dr. Sante 0% cosmetics contain plant extracts from medicinal plants such as ginkgo biloba, ginseng, chamomile, burdock, pomegranate, lavender, peppermint, lemon balm, and aloe vera, soy protein, wheat protein, shea butter, collagen, keratin, panthenol, allantoin. They provide effective skin and hair care, helping to preserve your youth and beauty.